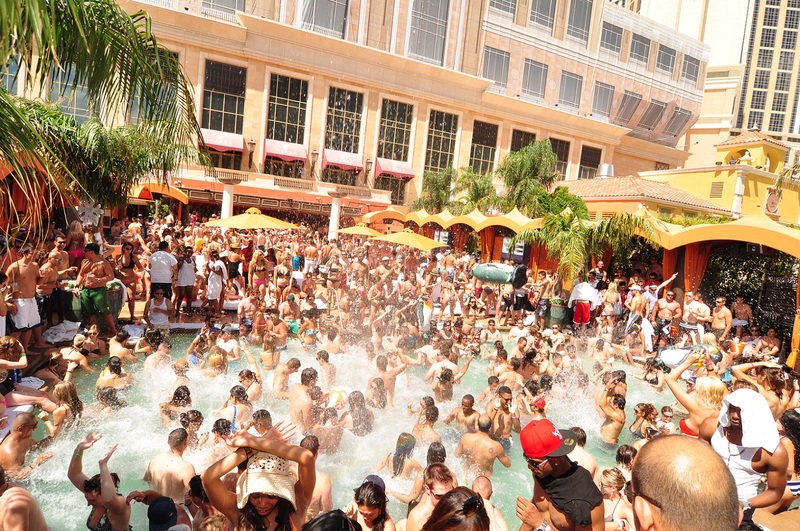 For those of you who do NOT think the photo above is a highly realistic representation of the 9th circle of Hell, you might want to check out a new mobile app and website, created just for “day-drinking and pool-partying fiends” to find the hottest pool parties in Vegas. PartyPetition helps you compare rates of multiple dayclub venues via an “electronic host” who supposedly has the inside scoop on all the latest dayclub events and parties. Users can scroll throug events by date, view venue information, and secure bottle and table reservations. Users can “petition” an all-inclusive budget for a set number of guests, requesting table or bottle service at popular daytime party spot like Marquee Dayclub, TAO Beach, and Palms Pool. Additionally, users can avoid the c hassle of splitting the bill and collecting money with PartyPetition’s split payment feature. When a venue accepts a “petitioned” all-inclusive budget, users will have the option to divide the bill amongst several credit cards at the point of sale. Petitioners Inc. created PartyPetition to make the nightclub and party lifestyle more accessible. Currently available on iOS mobile devices and at www.partypetition.com, PartyPetition operates as a personal e-concierge service for people looking for party experiences in Las Vegas. Click for more on Hotel Pools in Vegas.